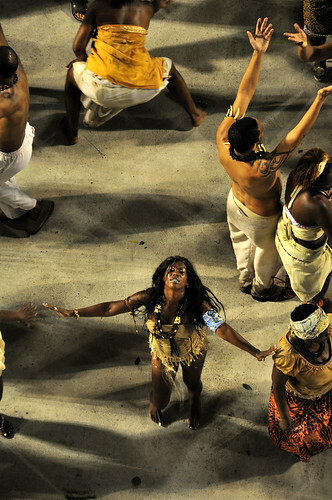 The Sambadrome consists of a viewing area for spectators and an alleyway down which the Samba Schools parade in the annual Sambadrome Parades of Rio Carnival. 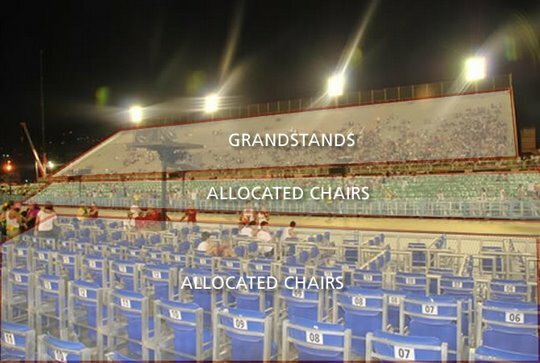 The seating areas are divided into various sections, or sectors, which are located on both sides of the Samba runway for optimal viewing of the Rio Carnival parades of Samba Schools. Sectors are individually numbered and range from Sector 1 to 13. 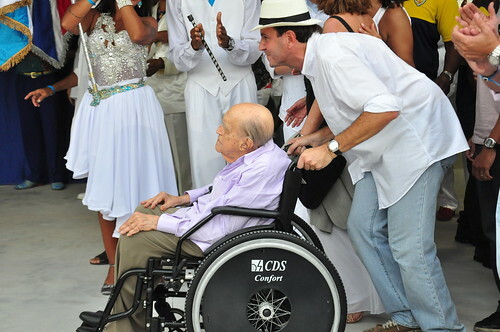 Each sector has its own unique advantages when it comes to viewing the Sambadrome Parades, as the parade evolves as the Samba Schools progress down the samba runway. As per the design of visionary architect Oscar Niemeyer, the Sambodromo sectors are individual free standing concrete structures that are spread along the Samba runway in a symmetrical fashion. Sectors are identified by numbers, which increase as one moves along the parade runway toward the climactic conclusion at the iconic arche of the Apotheosis Square. 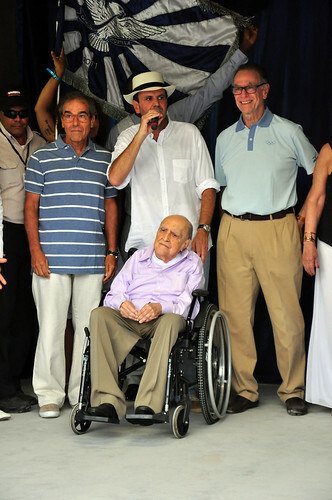 Even numbered sectors are located on one side of the parade route and the corresponding odd numbered sector is located directly across the Passarela Professor Ribeiro Darcy. Within each sector, spectators have the choice of three basic ticket types, each with something unique and special to offer. Grandstands are general admissions seats located at the top of each sector. These are the most popular tickets in the Sambadrome and provide a spectacular view of the entire length of the parade from above. 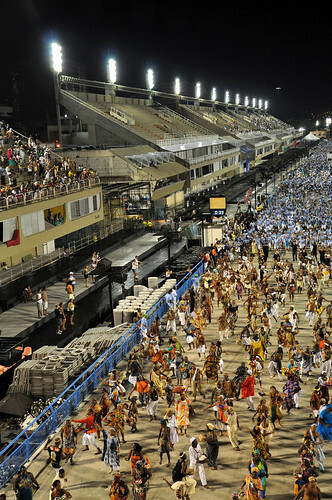 Frisas are open air front boxes spread along the Samba runway in escalating rows ranging from A to D. Spectators may purchase the entire box of 6, or they can purchase fewer seats and share the box with another group. Camarotes are luxury boxes located between the frisas and the grandstands. Camarotes offer a complete VIP service and are the most exclusive ticket in the venue. Sector 1 is the only sector that does not offer Camarotes or Frisas and only provides Grandstand seating. 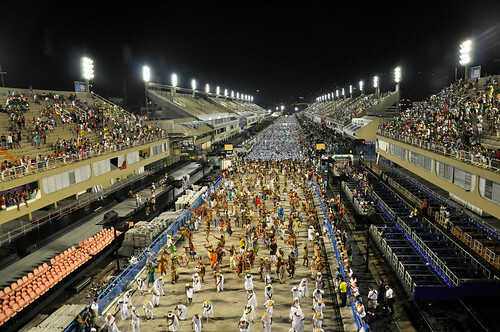 The parade of Samba Schools start at the lower-numbered sectors, proceed toward the higher-numbered sectors and conclude at Apotheosis Square. 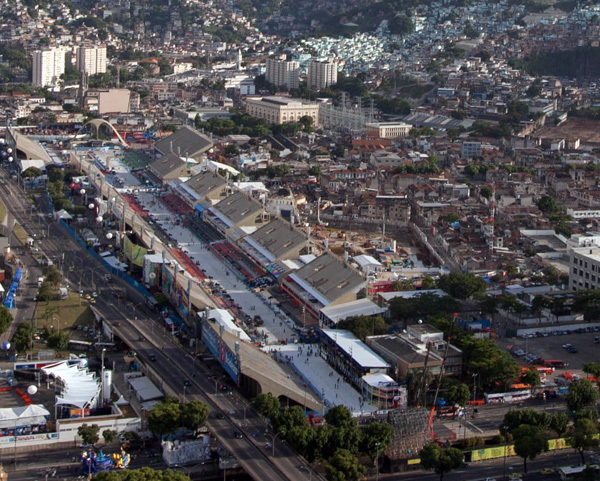 Be advised that prior to Carnival of 2012, the Sambodromo underwent renovations to prepare for the 2016 Summer Olympics. As a result, the layout of the venue has changed in recent years. 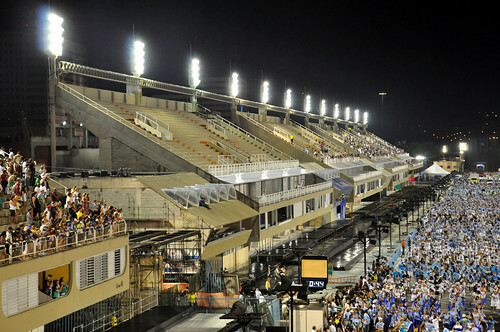 The previously long sector 2, which only accommodated luxury suites, has been knocked down and replaced by sectors 2, 4, 6, and 8, which are situated directly across the Samba runway from Sectors 3, 5, 7, and 9. There are unique benefits to sitting in sectors located toward the beginning of the parade route. 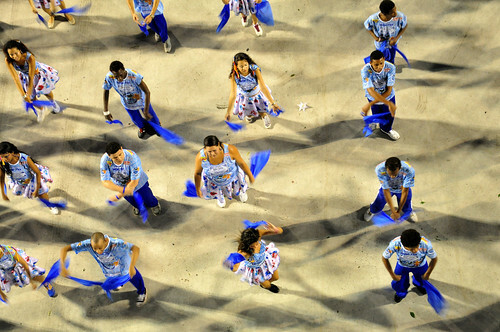 First, persons sitting in the lower numbered sectors will experience less of a lag time between the conclusion of one Samba School’s procession and the beginning of the next school’s performance. 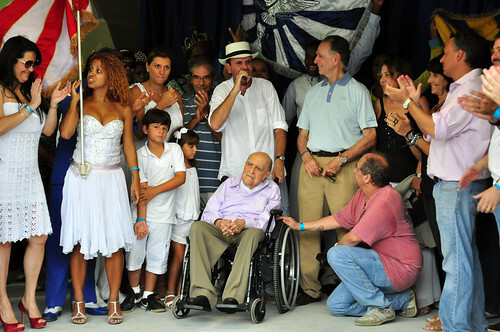 Spectators seated near the Apotheosis Square can wait quite some time before the next Samba School reaches them. The next benefit of sitting near the beginning of the parade has to do with the excitement and exhilaration of watching the opening performance of a school’s parade. The crowd goes wild, and many find the beginning moments of the parade to be the most exciting, as a year has passed since the school’s last performance. 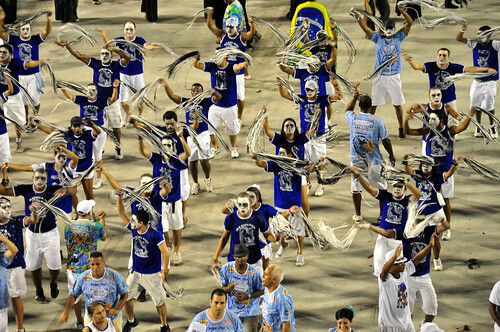 The introduction of the Samba School is the most anxiously awaited moment of Rio Carnival, as after a year of waiting, the Samba Schools announce the theme for this year. Just as exhilarating as the beginning of the parade, the final moments of a Samba School’s procession down the Samba runway is equally as exciting. By this point the dancers, singers, drummers and every other member of a School are fully warmed up and ready to offer the best performances of the entire parade. With the iconic concrete arch of Apotheosis Square in plain sight, the paraders come to the sobering realization that for them, this year’s Sambadrome Parade is nearing its conclusion. 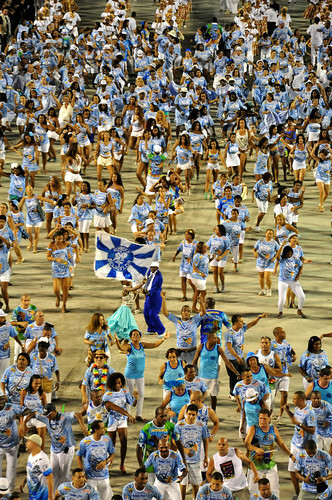 At the end of the parade the energy kicks into full gear as the parading members of Rio’s most elite Samba Schools try their best to make the most of the remaining moments in the spotlight. Spectators toward the end of the parade route may also notice paraders speeding up the performance to avoid losing marks by going over the allotted time. There is, of course, one additional perk for spectators sitting in the allocated chairs (Cadeiras) of Sectors 12 and 13. 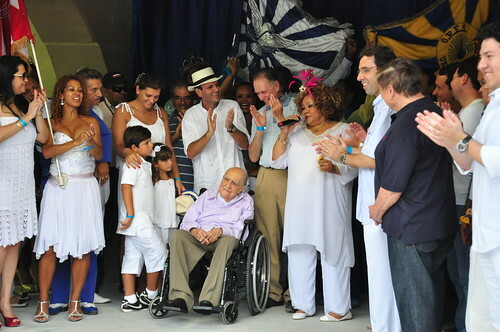 After their parade, the Samba Schools gather in an open air style theater forming Apotheosis Square at the end of the Passarela Professor Darcy Ribeiro. This is where many paraders take off their costumes and leave them in the Apotheosis Square as they head to any one of the many parties going on throughout Rio, so sitting in these Sectors, while they are not as good for viewing the opening performances, can provide spectators with the opportunity to salvage abandoned costumes to wear at Carnival Balls or parties later that evening or on another night during the sultry festival of Rio Carnival! 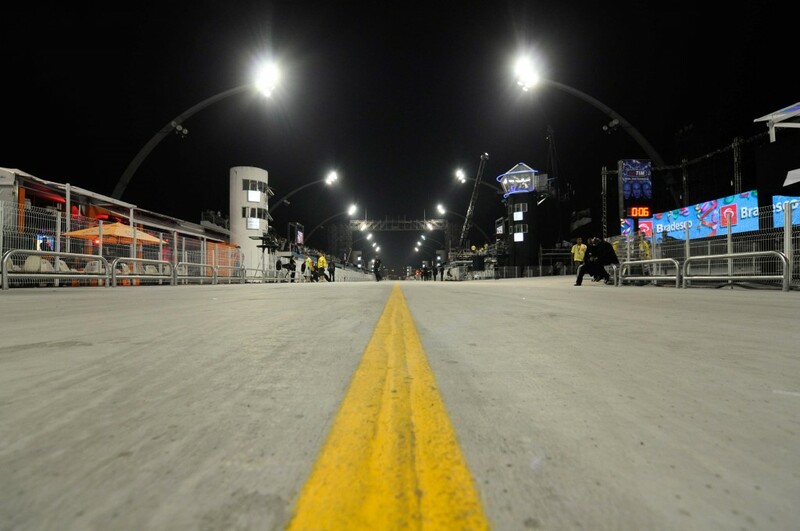 After the 2012 reconstruction of the even side of the Sambadrome, the old Sector 4 became the new Sector 10. 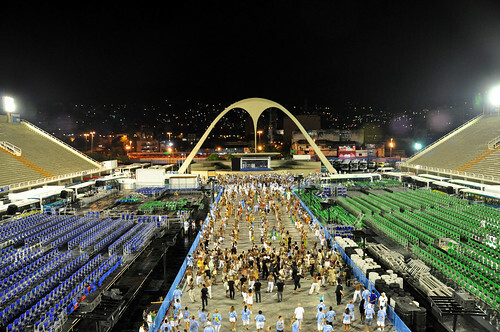 Prior to the renovations, seats in this sector experienced moderately obstructed views of the Samba runway due to the long sector 2 that only consisted of luxury suites — but now that sector 2 has been knocked down and the formal balance of the Sambadrome has been restored, this is no longer the case. A popular choice among Cariocas who tend to sit together in small groups, Sector 10 is now a wonderful choice for those who wish to sit in the grandstands. 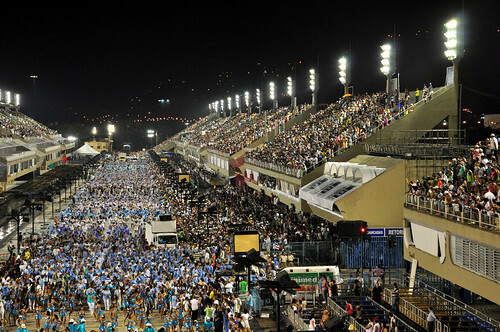 The Arquibancada bleachers of Sector 10 offer spectacular views of the parade as it evolves from start to finish. Due to its relative location near the end of the parade route, Sector 10 is also generally the cheapest of the frisa (front box) tickets. Sector 11 is considered by many to be the most exciting sector in the Sambadrome. Seats in this sector offer a unique experience as it is located directly in front of the drummers’ niche, also called the “Recuo da Bateria”. 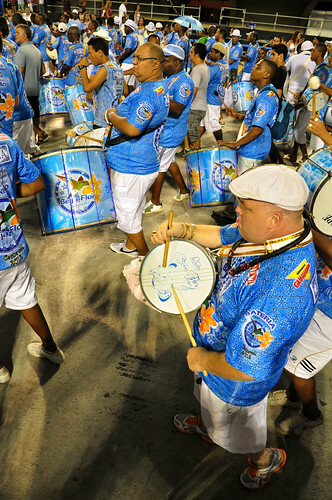 The drummers’ niche marks approximately the halfway point of the procession, and is situated in the location where the percussionists from each of the Samba Schools’ bateria are required to stop and keep drum while the judges award points for this category. Sitting in Sector 11 is a thrill all to its own, as spectators in this section feel the pulsating beats of the drums as they echo throughout the Sambadrome. Spectators sitting in sector 11 tend to get into the Carnival spirit long before everyone else. 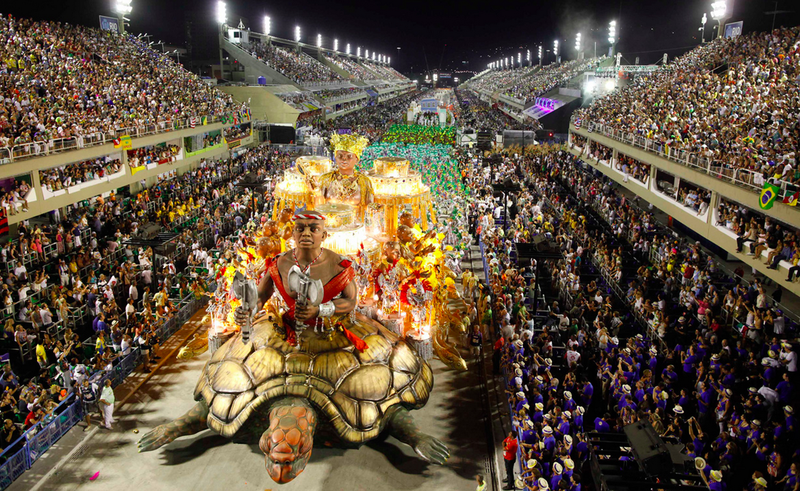 Located towards the end of the parade route directly across Sector 10, Sector 11 offers great views of the end of the parade as the Samba Schools make their climactic march toward the arch of Apotheosis Square. Sectors 12 and 13 are the two sections of the Sambadrome located the closest to “Apotheosis Square” at the end of the parade route. Seats in Sectors 12 and 13 consists of reserved chairs that are considered a great value for your money, especially in comparison to the other reserved seats in the Sambadrome. Seats in these Sectors are organized in long rows of allocated chairs facing the parade route. 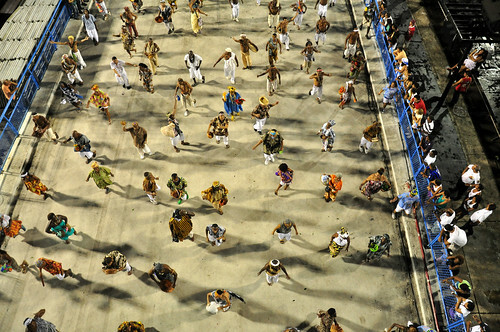 Apotheosis Square marks the finish line for Samba Schools, where members gather at the end of their performances to take off their heavy costumes. 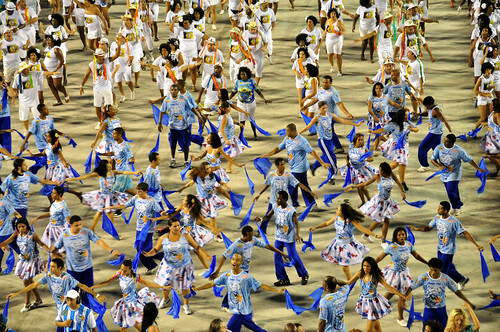 Many of the paraders stay to enjoy the rest of the schools perform, but many of them leave, either returning home or going to one of the many Carnival parties held throughout the city. It is not uncommon for parade participants to take their costumes off and leave them in the Apotheosis Square, providing the unique opportunity for spectators sitting in Sectors 12 and 13 to rescue abandoned costumes.